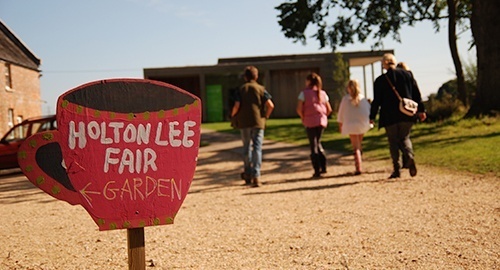 As a member of the Countryside Mobility scheme, we believe in the importance of making Livability Holton Lee a truly accessible leisure and tourism destination. We have five off-road electric mobility Trampers available (left and right-handed and one with joystick control). These are available to hire at £2.50 per hour for site visitors, or can be included as part of a package for people hiring one of the holiday cottages. For planned group visits or tours we also have a stretch-golf buggy – the Ambug – can carry up to five people, including a wheelchair user. Located around the site are seats, marker posts and maps to guide you. Access is also available to horticultural areas, bird hides, viewing points, geocaches and orienteering markers which are located throughout the Estate. We also have a 250m wheelchair accessible labyrinth. Leaflets showing features of interest and the various graded routes are available from the Farmhouse, the Coffee Shack and the noticeboard holder in the car park. We are grateful for funding from the Higher Level Stewardship Scheme, via Natural England, as well as a substantial grant from Viridor Credits which have enabled further access improvements to the heathland. We also have occasional guided walks and classes e.g. photography, wild flower identification, bird watching, landscape painting, health walks and orienteering routes. Check the Events section for upcoming activities. We also have a small range of outdoor exercise equipment being installed on a route close to the parking area in order to facilitate exercise for those with limited mobility. To check availability of a Tramper or discuss a group tour, please use the contact form, or call us on 01202 625562. 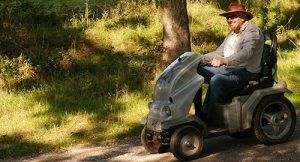 As well as mobility vehicles, we offer mobility safaris around our 350 acre, wildlife rich grounds that help everyone enjoy the environment. We have an electric stretched golf buggy that can accommodate two wheelchairs (at a push) and five non – wheelchair users. The buggy can be used in most weathers following the extensive network of wheelchair paths. The purchase of the buggy was made possible through a grant from The Clothworkers’ Foundation. We can offer you guided tours around the grounds taking in the wildlife and landscape, and the historical and archaeological interest in the area. As well as general interest tours, staff can offer outdoor classes and field trips with opportunities to learn about digital photography, habitat management, plant ID, ornithology, creative writing, landscape painting etc.